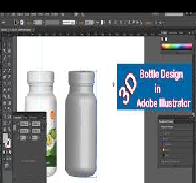 Creating a 3D Package with Full Color Graphics The goal is to create a 3D package covered with full-color graphics. This package will be used to package your product. Graphics for the package must match your label designs closely (if not exactly). 1. Look at templates on Artios CAD, or draw your own. 2. Template shape can be customized to suit your graphic design approach, or used “as is”. 3. Use layout software (CAD) to position your graphics on the template. 4. Include necessary items: ingredients, a bar code, nutrition information, product blurb, contents volume, etc. as needed. 5. Print your graphics/template page on high quality paper. You may use permanent spray to draw your graphic print. 6. Cut out template, score all fold lines, and glue holder together (carefully). interesting handle shape to enliven your design. 2. Picture of the three labels. 6. Pictures of the first prototype. 7. Define the weaknesses of the first prototype. 8. Explain the process of improving your prototype. How did you improve the prototype? 9. Picture of the final package with printed graphics adhered to or stenciled on package. 10. Conclusion: explain how this package could be improved.